Gypsum powder has been used in our life and many industries for a long time. In our ordinary life, human use it produce chalk, tofu and craft, etc. In industrial field, It is often used in building industry as putty and desulfurization industry as agent. To produce building gypsum powder, experienced engineers often use vertical mill and fluidized bed boiler as the main machine. By using this method, the gypsum powder production plant is easy to control and the quality of the final gypsum products are quite high. Meanwhile, because it is one automatic design, the labor cost low. What’s more important, this method is quite environment-friendly, meeting many countries’ e Eco-Conscious Standard easily. Currently the world's most popular desulfurization process is limestone-gypsum method. But there is one big problem in the past, the fineness of the powder should be reach D90=325 mesh. To meet the finess, currently, more and more producers are recommended to use vertical mill or Supper-pressure grinding mill, like SBM MTW series trapezium grinding mill. With these two mills, producers can not only meet the fineness requirements, but also can cut some operation costs for their stable performance. The history of gypsum powder application is so long that it could date back to the time when it was simply used for making chalk, putty, tofu and crafts. Nowadays, it has been widely used in many fields, such as construction and building materials. Gypsum stone is crushed into particles of less than 30mm in diameter, and the particles are grinded in the mill. 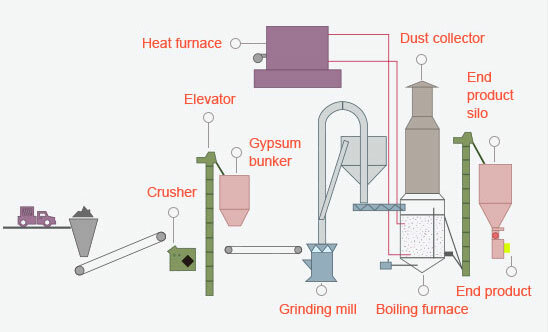 After grinding, the powder which passes the classifier would be transformed into the furnace for calcinations, while the rest which doesn't meet the fineness requirements would return to the miller for a second grinding. The qualified calcined gypsum powder are sent to end product bin or workshop.